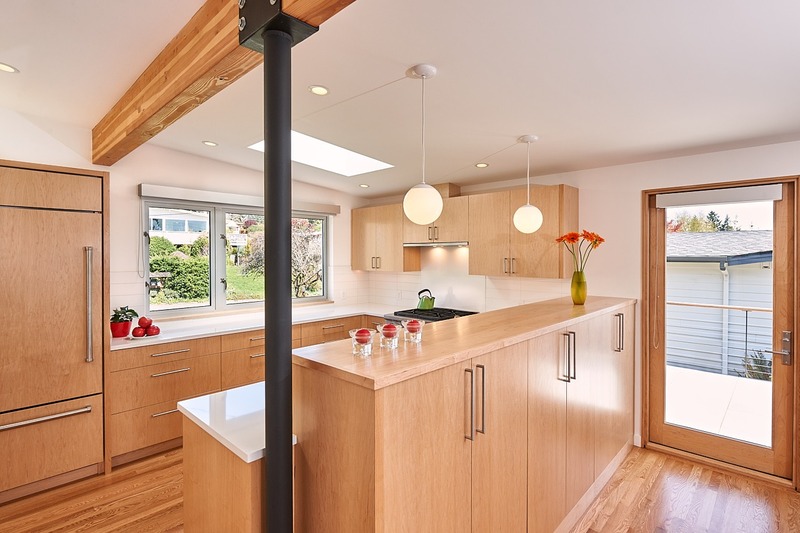 With their two children fully launched into careers and living in different cities, our clients decided it was time to leave their 3800sf family home and downsize their daily lives. 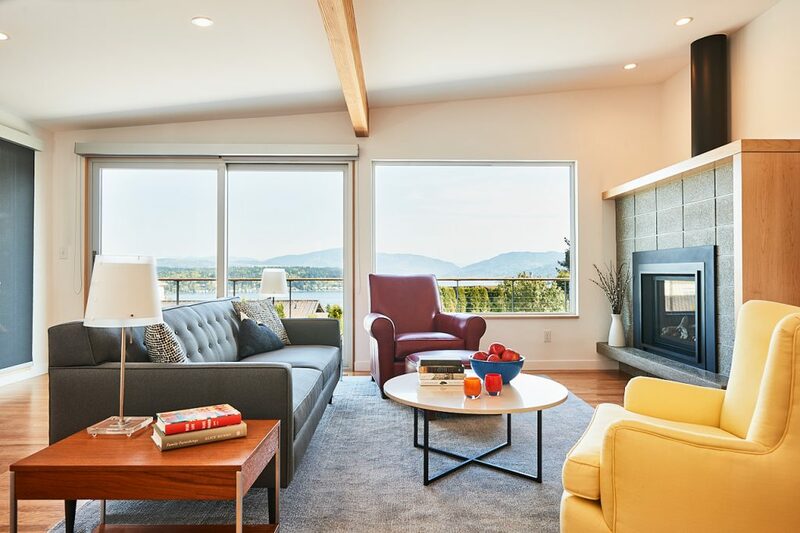 They wholeheartedly embraced this move, especially when they found a modest mid-century rambler in a sleepy east Bellevue neighbourhood with huge territorial views overlooking Lake Sammamish. 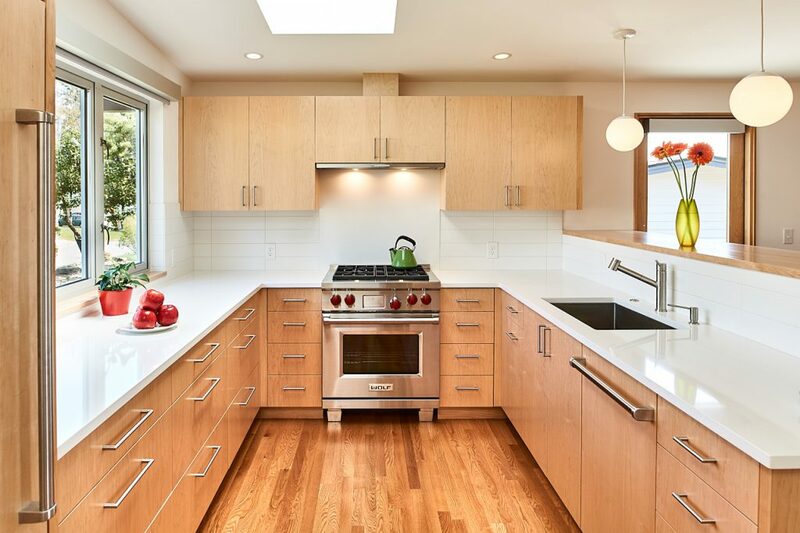 This much smaller home was in original condition and ripe for a full remodel, offering great opportunities to uncover the structural features that would highlight its mid-century bones. First order was to remove many of the interior walls that partitioned the house into small dark rooms, and open the living spaces up to each other and to daylight and views. 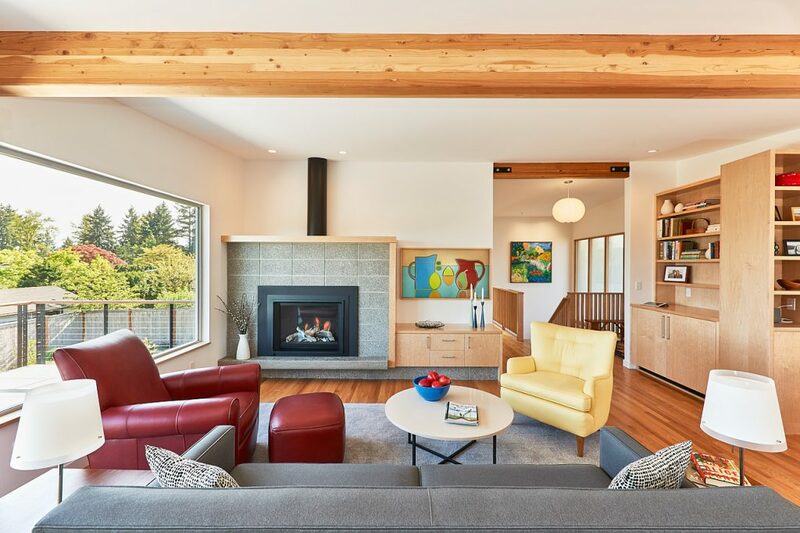 In doing so, we uncovered the big old FIR beams that support the broadly sloped roof, allowing the interior to read as a large open space under a sheltering roof plane as the dominant element – a classic mid-century motif. We also added large swaths of windows and enhanced the decks. 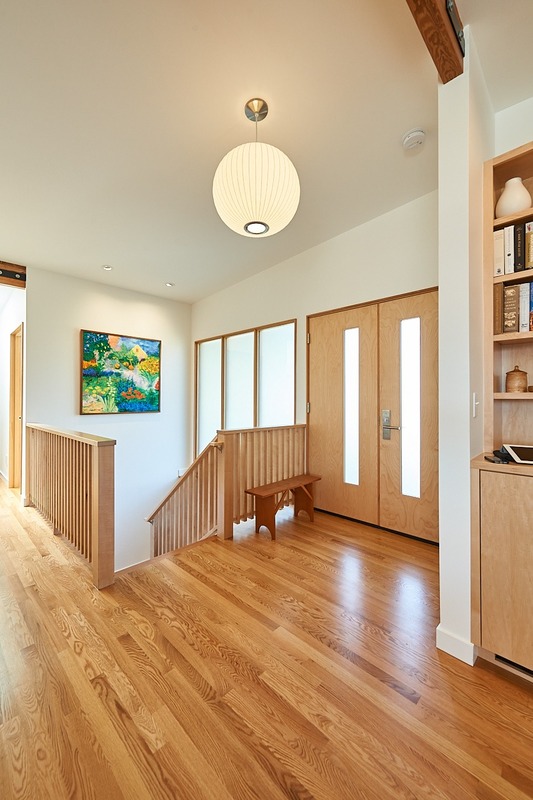 Our client hails from a Norwegian heritage and was interested in introducing a “Scandinavian modern” feel to the interiors, which we all agreed would be a perfect approach given that region’s great historical contributions to the modern architectural movement! 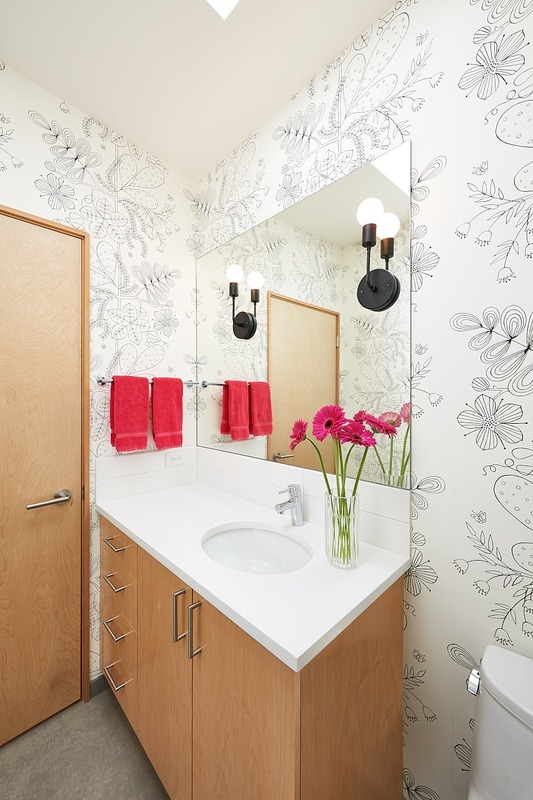 This led to a very light, minimalist palette of finishes and fixtures, and whimsical pops of colour. Cabinets are all clear maple; floors, tile and countertops are all light grey or winter white. Most fun of all was the chance to design a new concrete block fireplace, introducing a very textural and cozy, yet unabashedly modern focal point! Our clients’ biggest challenge in this project was to make tough decisions downsizing their family belongings; ironically, including old family Scandinavian furnishings and dinnerware. The tough work done, we’re told it feels pretty good!….kind of like shedding a lot of excess weight! 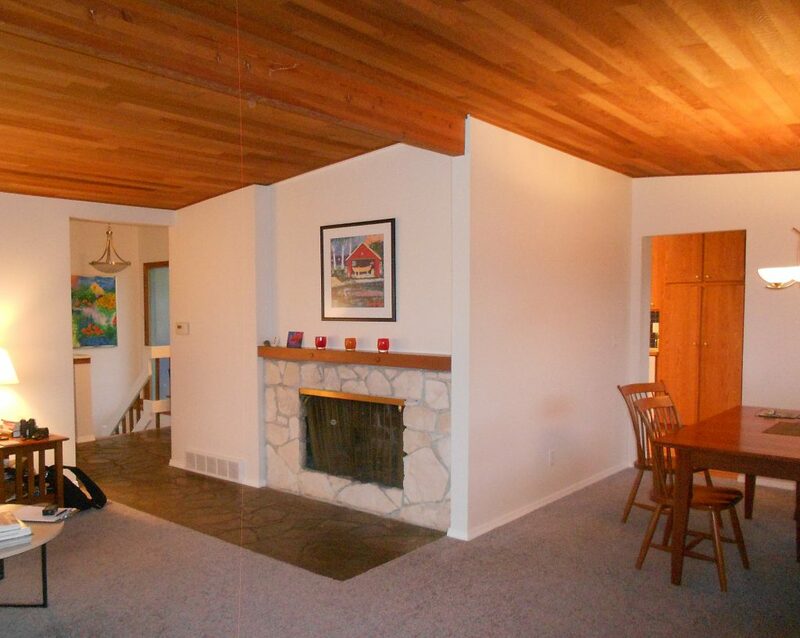 Praise to those architectural masters of the Mid-Century – they really knew what they were doing!